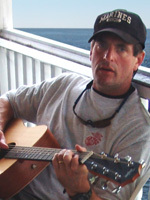 Jack is a New Jersey based musician who has played the Shore circuit and New York City Clubs since the early 90's. He is known for his unique sound - both vocally & on the guitar. He writes a wide range of music, from stirring ballads to the funky, bluesy music of his band, Rogues on the run. The Rogues are currently playing the Jersey Shore, and have opened for BB King. They have 2 CDs out and a new one on the way. Previously, Jack was co-founder, with Gene McCormick, of "Jersey Blue" (Bernard Purdie on drums). Before that he was a member of Philadelphia-based "Windfall," who opened for KISS. Jack has a new solo CD out in 2006. Check it out here: BellaMar.